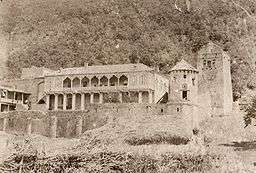 Ksani Duke's kastle in Akhalgori. 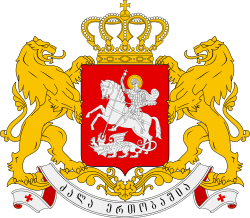 The Duchy of Ksani (Ksani Saeristavo, Georgian: ქსნის საერისთავო) was an administrative unit in feudal Georgia Originally, to Kksani Saeristavo consisted of the Ksani and two more small valleys. Ksani Saeristavo consisted of two administrative entities: Ksniskhevi, with its centre in Kvenifnevi and Tskhradzmiskhevi with its centre in Largvisi. Tskhradzmiskhevi started to become dominant in the 10th century when it included gorges of Lekhura, Medjuda and upper side of the river Liakhvi. Ksani Saeristavo expended towards the south as well. As a result of expanding to the south, the residence was relocated from Largvisi to Kvenifnevi. According to Vakhushti's references, during the reign of King Tamar, Kartli and Ksani were different Saeristavos. After the Mongol invasion of the second half of the 13th century, the dukes of Ksani were of the Bibiluri family. In the 14th century, Saeristavo included: Tskhradzma, Jamuri, Kharchokhi, Jurta, Kholoti, Isroliskhevi, Abazasdzeta, Truso, Ghuda, Gagasdzeni, Mleta, Arakhveti, Khando, Khanchaeti, Dzagnakora, Dighuami, Gavasi, Atseriskhevi, Bekhushe. In the 15th century, the Saeristavo practically became a Satavado ("manorial"). Prince Iulon of Georgia, 1790—1801. (Georgian) GSE, (1986) volume 10, page 683, Tbilisi. This article is issued from Wikipedia - version of the 2/9/2014. The text is available under the Creative Commons Attribution/Share Alike but additional terms may apply for the media files.